Mission: The customer needed 24 hour access to tower sites and right of way to continue building transmission lines. Results: From west of Edmonton to east of Calgary, Northern Mat & Bridge (NMB) provided multiple crews that were working with access points to the right of way. NMB installed pads for the lay down of work space, provided access for the concrete trucks, screw pile excavators, and with the services provided, client work crews were able to access tower sites and continue their progress. This job has been the largest and longest project to date for NMB. 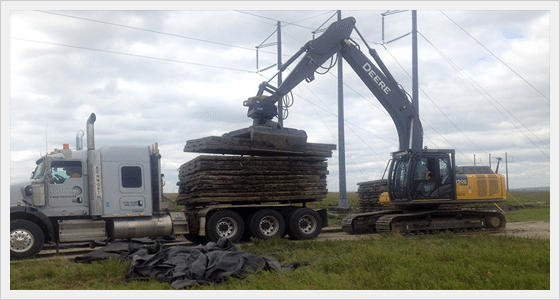 Mission: Lay access mats to protect the land with minimal disturbance. 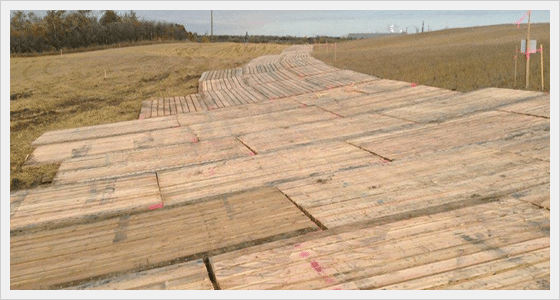 Results: Northern Mat & Bridge provided 4,700 access mats for a power line project in Southern Saskatchewan. 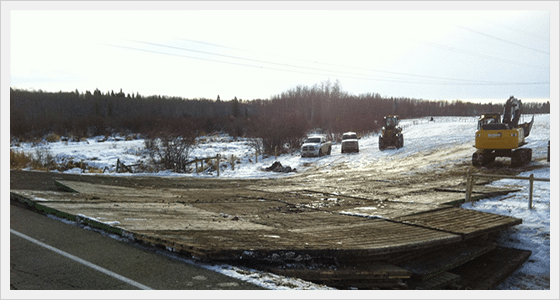 14” of rain made completing the project difficult, Northern Mat & Bridge laid mats to protect the pasture land and give crews access to site without disrupting the integrity of the land. 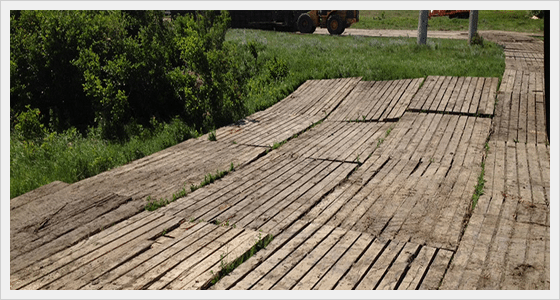 Results: In the Weyburn-Estevan SK area, Northern Mat & Bridge leapfrogged mats to gain access to the right of way and built pads for cranes and lines stringing equipment. Mats for wash areas and structures access were provided over wet and muddy terrain. The access solutions provided also prevented the transfer of noxious weeds to non-affected areas. The mats that had been exposed to noxious weeds were pressure washed/steam cleaned to prevent the transfer of spores thus maintaining environmental integrity. Results: Northern Mat & Bridge have been awarded the contract to provide Access and RIG Mats for the Northwest Sturgeon Refinery Facility Project which involves rebuilding and realigning transmission lines around the east side of the Northwest Sturgeon Refinery site to allow improved access to the refinery.